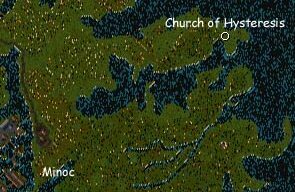 Coordinates:136T°N 128°WAt Bishop Benedict’s invitation I set out early one fine Wednesday morning with my companion to visit The Church of Hysteresis’ chapel in the woods north east of Minoc. Leaving the city we were soon engulfed in silent forest, passing only an occasional rabbit or eagle. As we drew near the peninsular northern end of the land, we passed a strange building covered in ice and stopped to marvel at it. Finding nothing of interest Frarc and I soon moved on and as we entered the peninsular region, we began to encounter foul beasts intent on halting our pleasant walk. In travelling to the Church, we passed such beasts as mongbats, dire wolves, orcs, harpies and trolls. To get there, exit the city of Minoc from the eastern bridge following the path that leads past the small mining area. Continue across a second bridge further east and then head through the woods north and east to three fingerlike peninsulas. The Church is located at the northern end of the middle peninsula. The Church is undergoing rapid expansion and currently has two locations. Staff now less frequently visits the small quiet chapel I visited. It’s often used for small romantic weddings, which can be performed by the Bishop upon request. Other types of ceremonies may also be held here again upon request. 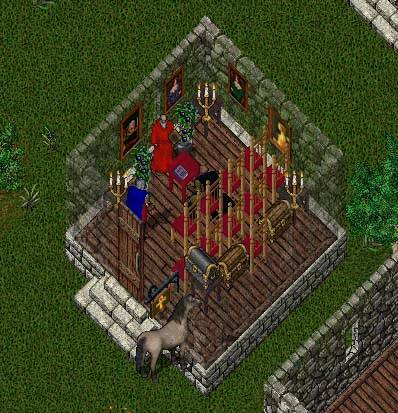 More often, the Bishop may be found at the newer location in Dragon Tower. Each chapel will have a rune for the other providing easy access to both locations. Copies of the Bible and other literature may be found in either Chapel. 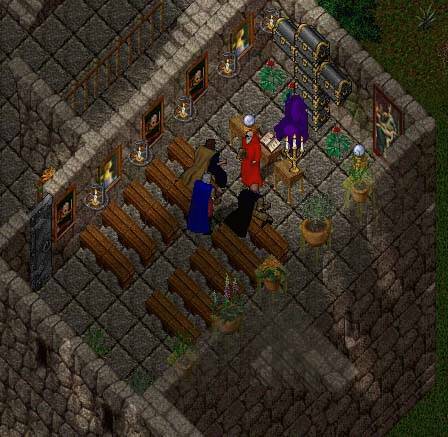 The Chapel in Dragon Tower is located a few floors above the Dragon Tavern so one can often find a friendly ear in one place or the other. We were greeted there not only by the Bishop but also by Ruth, Shivan and others. Plans have been made to create yet another branch of the church in Felucca as well. In general Grand Bishop Benedict can be found in the Chapel at Dragontown weekday mornings and weekend afternoons (EST).